Your doctor may be able to see a cleft lip before birth. It may be seen during a prenatal ultrasound . 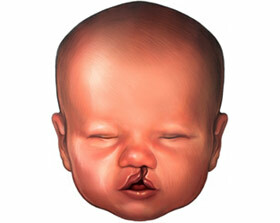 A cleft lip can be seen as early as 18 weeks into pregnancy. Cleft palate may be harder to see before birth because it is inside the mouth. Treatment can’t be started until after birth. However, diagnosis during pregnancy will give the parents and the medical team time to make a care plan. Talk to your doctor about any medicines during pregnancy . Only use them as directed by your doctor. Cleft lip and palate. EBSCO DynaMed Plus website. Available at: https://www.dynamed.com/topics/dmp~AN~T115764/Cleft-lip-and-palate . Updated October 4, 2017. Accessed June 27, 2018. Cleft lip and palate. Nemours Kid's Health website. Available at: http://kidshealth.org/parent/medical/ears/cleft%5Flip%5Fpalate.html. Updated October 2014. Accessed June 27, 2018. Facts about cleft lip and cleft palate. Centers for Disease Control and Prevention (CDC) website. Available at: http://www.cdc.gov/ncbddd/birthdefects/CleftLip.html. Updated June 27, 2017. Accessed June 27, 2018.